bl.uk > Online Gallery Home	> Online exhibitions	> Asia, Pacific and Africa Collections	> Landscape, Hazaribagh (Bihar). Hazaribagh is a small picturesque town north of Ranchi in Bihar. Before the arrival of the British it was nothing more than a cluster of hamlets. The British made the town the centre for their civil administration for the state and as a result there is a good deal of colonial architecture, including a cantonment, a post office and numerous bungalows used to house the British stationed in the area. Lieut. Colonel W.R. Gilbert served as the Commandant of the Ramgarh Battalion, Hazaribagh. 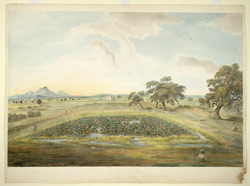 This drawing shows hills, paddy fields, a small Muslim tomb and a lotus pool in the fields that surround the town.